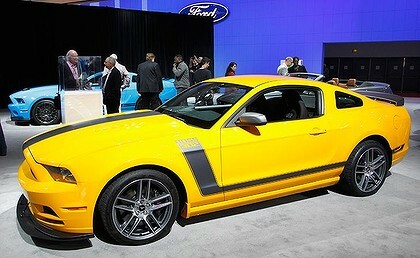 Post subject: Ford Mustang for Australia? Ford’s iconic pony car could one day be available in Australia – and with a four-cylinder engine - but does it also offer any salvation for the Falcon? Ford’s iconic Mustang could soon be headed to Australian showrooms and there’s speculation the move could ultimately lead to a program of large, rear-drive sedans – similar in principal to the locally-produced Ford Falcon. While it’s too early to go joining the many dots about whether the next generation Mustang could save the Falcon – its expected to be killed off in 2016 and replaced by a global family car such as the Taurus or Mondeo (to be badged Fusion in America) – Ford fans will no doubt be keen to hear of any potential connection. The prospect of a four-cylinder version of the Mustang is likely to be less welcomed by the faithful; more on that later. At the very least there appears to be some light that a large, high performance, rear-drive sedan could be a possibility within the fast changing Ford world, sharing the underpinnings of the next Mustang. Reports emerging from America and Europe suggest the next generation of the Mustang will be produced in left- and right-hand-drive, opening the potential for exports to countries such as Australia (American muscle cars have traditionally been produced with the steering wheel on the left only). Enthusiast website PopularHotRodding.com and respected German motor title Auto Motor Und Sport are both reporting the next generation Mustang will be designed for global markets, including right-hand drive countries like Australia, Japan and the United Kingdom. Similar reports emerged last year with speculation that Ford’s design studios in Europe and Australia were helping shape the next generation styling. Auto Motor Und Sport quotes Ford Europe’s head of development, Barb Samardzich, as saying the next generation Mustang will be engineered to meet European Union safety standards; but says no decision has officially been made to expand the Mustang’s reach. Set for release in 2015 the new Mustang is believed the biggest change in the history of the iconic pony car that was first launched in 1964. The new car will ditch the retro design of the current model, add new efficient engines, cut weight with more advanced materials, and sit atop all-new underpinnings with modern independent rear suspension (the current Mustang still uses an archaic live axle rear end). It’s the last point that is the most interesting because it offers up a potential lifeline for a large rear-wheel-drive sedan such as the Falcon. One website whose author for the story is the editor of TheMustangNews.com is taking it a step further; according to the PopularHotRodding.com story the Mustang would be based on an all-new global platform that could be shared with the Falcon. Of course, any future Falcon-sized large car would not be a Falcon in the traditional sense; the made-in-Australia-for-Australians large car is only guaranteed until 2016, with anything beyond that set to become a global car as part of the One Ford strategy that aims to reduce development and production costs by producing one car for all markets. While Ford has been cagey about its future models, other US car makers such as General Motors and Chrysler appear keen to have a high-performance four-door sedan in their lineups,, presumably on the assumption there is a market longer term. Despite struggling sales of large cars in Australia sales of high performance models have remained healthy; about one in four Commodore sales these days are for the V8 model. With the increasing speculation that the Holden Commodore will be exported to the United States wearing a Chevrolet badge and Chrysler’s recently-released second generation 300C, Ford would be the only US brand without a rear-wheel drive sedan offering. PopularHotRodding.com speculates that adding a sedan to the Ford US line-up would also help the blue oval maintain the productivity of the Flat Rock plant that currently builds the Mustang. That in itself suggests that if – and it’s a big if – Ford were to develop a rear-drive sedan, then it would likely be produced alongside the Mustang in the US, in line with expectations that Falcon production will cease in 2016. The same factory also produces the Mazda6 but the Japanese brand has announced it will end that arrangement in the near future. Other potential details about the next generation Mustang include a direct-injection version of the current 5.0-litre V8 engine (a version of which is used in the Falcon) to power the range-topper and the 2.0-litre four-cylinder turbo EcoBoost unit to motivate the entry-level model. More extensive use of aluminium and high-strength steel in the body is expected as the engineers try and cut more than 100kg of weight compared to the current Mustang. Are they daft to even put the term "4 cylinder" in the same sentence as "Mustang"? 0.0 so i would seem. why would you buy a Mustang with a 4 pot in it in the first place ? but the first monaro had a 6pot O.o... even the vy?? had the charged 6pot.. stupid. Indeed. And it did sell. If this is true then I'll be glad to see the iconic muscle car back in dealerships at a reasonable real world price. The current import only schemes mean the only ones that can afford them are proffessionals and aspiring drug dealers. Bring us the mustang. And the f trucks. that's more what I was thinking, and the humungo 350s with big powerstroke diesels noone could afford to run not sure I agree with a 4 cylinder mustang, it just sounds dirty. Love F-Trucks... just a beast of a ute. It's a real "mini truck"